An Aquatic Invasive Species (AIS) is a marine animal that relocates to a new habitat and disrupts the natural balance of the ecosystem. These species may have no natural predators in their new habitat and therefore often grow in abundance, threatening the survival of the native species. One aquatic invasive specie that is currently an issue in eastern New Brunswick is tunicate. “Tunicates, or sea squirts, are small marine animals that spend most of their lives attached to an underwater substrate. They are named "tunicate" for their thick skin resembling a tunic. They feed by filtering seawater through their siphons”. Currently tunicates have not been found on the Miramichi. 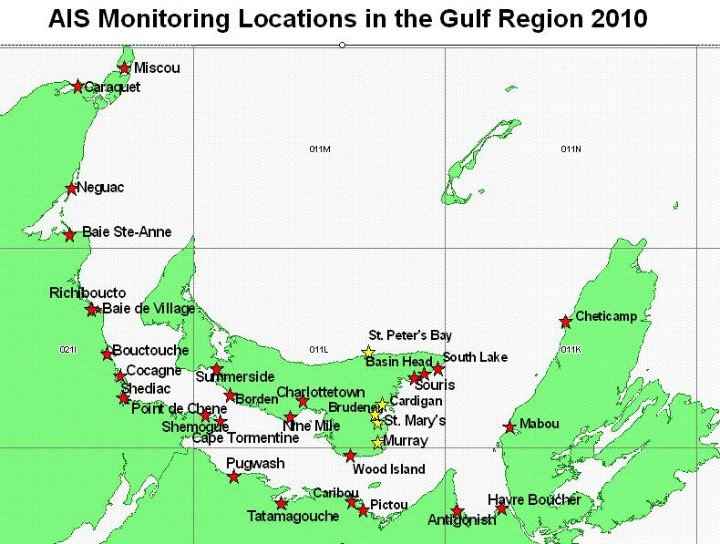 DFO’s tunicate monitoring program is relatively new starting in 2009, with 28 sites monitored throughout the Gulf Region coastlines of New Brunswick, Nova Scotia, and Prince Edward Island. Several of these sites are now located on the Miramichi. As of 2012, 34 sites are being monitored, with sites on the Miramichi at Escuminac, Baie Sainte-Anne, Chatham, Douglastown, and Neguac. These tunicates have been spotted at monitoring sites around Prince Edward Island and some found in Nova Scotia. Tunicates were discovered in New Brunswick at two locations, the Violet Tunicates was found along the southeast coastline around Cape Tormentine and during the summer of 2010 the Golden Star Tunicate was found at Caraquet. 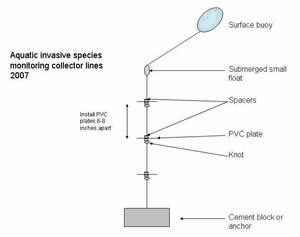 At these monitoring sites, two collector lines are placed in the water with three PVC plates spaced out along the lines. If tunicate larvae are present in the water, they may attach themselves to these plates and grow. 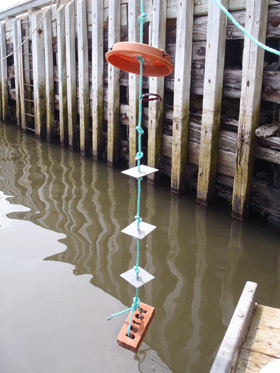 The collector lines are weighed down by a brick at the bottom and remain suspended in the water column using either a buoy or attaching them to a floating wharf. The lines are located where there is a lot of boat traffic, the most likely pathway for tunicate “hitchhikers”. These lines are deployed into the water late May or early June, plates are examined in August, and then finally retrieved in October. The plates are stored and sent to the DFO office in Moncton where they are processed in the lab to determine if tunicates are present, and if so, what species and what percentage of the plate is covered.